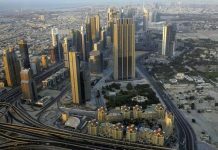 The commute between Abu Dhabi and Dubai may be slashed to 30 minutes if the inventors of an electric “superbus” have their way. The Superbus concept, the work of an astronaut and a former Formula One aerodynamics expert, will be showcased at the Commercial Vehicles Middle East trade event in Dubai from March 14. The midnight-blue bus travels at a top speed of 250 kph, is 15 metres long, 2.5 metres wide and 1.65 metres high and has eight gullwing-style doors on each side. It is made of lightweight materials including aluminium, carbon fibre, fibreglass and polycarbonate, and weighs just 9,500kg fully loaded. The vehicle would carry passengers in levels of comfort that the team says would be comparable to travelling in a luxury sedan. The chief designer, Antonia Terzi, previously the chief aerodynamicist at the BMW Williams Formula One team, outlined her plans for the Superbus at the 2009 World Future Energy Summit in Abu Dhabi, but the project has made considerable progress since then. A prototype has been built and was unveiled in Germany last September, days after it completed its first test run. The vehicle is being developed at the Delft University of Technology in Holland under the direction of Professor Wubbo Ockels, who in 1985 became the first Dutch citizen in space when he blasted off on board the space shuttle Challenger. 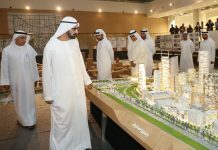 The project received a €7 million (Dh35.5m) grant from the Dutch government and has a number of heavyweight industrial backers, including the US chemicals giant Dow and the Saudi Basic Industries Corporation (Sabic). 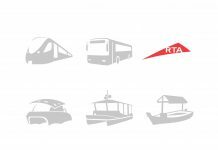 The Dutch team met with Dubai transport officials earlier this year, a senior Roads and Transport Authority (RTA) official confirmed. Mr Parham said the proposal was being discussed within the RTA. 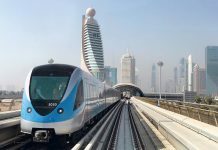 The team has produced an animated video showing how the sleek, environment-friendly vehicle would whisk up to 23 commuters from the capital to Dubai at lightning speed. It would travel on normal roads and also a dedicated concrete track running parallel to the existing motorway. 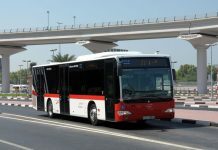 The film shows the streamlined Superbus starting its journey in Abu Dhabi and travelling at normal speeds on the existing road network as it picks up passengers. When the bus leaves the city it switches to the specially built track and accelerates to its cruising speed of 250 kph. 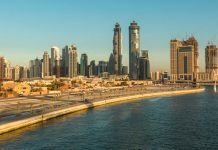 Then, as it approaches Dubai, it slows to normal speeds, rejoins the road network and drops off passengers at their destinations. 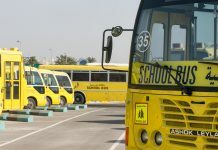 There would be no set routes or schedules – instead, a central routing system would enable a fleet of the vehicles to pick up and drop off passengers wherever they wanted without the need to change buses. “Commuters book online or with their mobile phone, and the bus picks them up and drops them at their desired location,” Ms Terzi said. 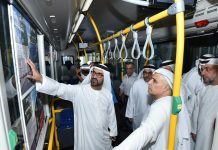 Brigadier General Hussein al Harethi, the head of the Abu Dhabi Traffic Police, said an electrically powered vehicle like the Superbus would not only help alleviate traffic congestion, but also reduce air pollution.